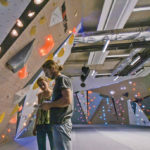 Indoor climbing has been growing at an incredible rate over the last few years. One of the driving forces of this growth is the increasing popularity of competitive climbing. 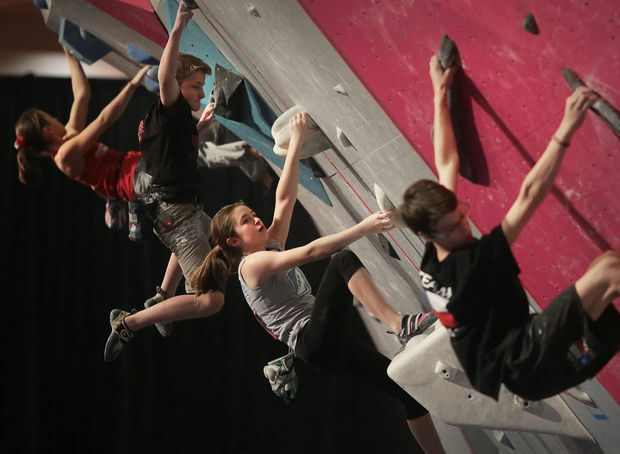 Hundreds of gyms across the country already support competitive climbing teams, and it seems as though every new gym is fielding a team. At no other point in the year is this more evident during Youth Bouldering Regional Championships, which took place this past Saturday. 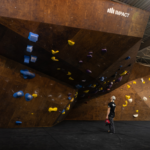 Almost every climbing gym in the country is affected by this one day comp, either as one of the 16 regional host facilities or as one of the hundreds of gyms that sent their team competitors and coaches to the competition. The event, which brought together 2,458 youth climbers aged 7 to 19, could possibly have been the largest single-day of climbing competition in the world. In fact, participation for Youth Bouldering Regionals jumped 23% over last year, while USA Climbing membership grew by 13%. Before the September 1st start of the current bouldering season, the country was divided into 5 competitive Divisions, comprised of 15 Regions. 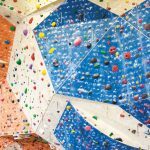 However, the disparate growth of indoor climbing from region to region has led to “an unequal distribution of competitors within Regions and Divisions across the country,” according to USA Climbing. This unequal pace of development led the climbing federation to form a Realignment Committee whose task was to redraw the regional and divisional boundaries in accordance with changing demographics. Using membership data and participant statistics from ABS and SCS Regional and Divisional events, USA Climbing and the Realignment Committee sought to address the main issues that arose from the old regional and divisional boundaries. 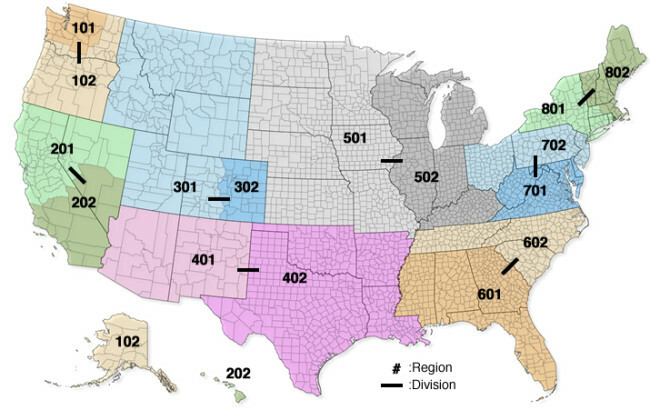 In order to address geographic inequalities resulting from the old regional/divisional boundaries, the USAC redistribution committee aimed to reduce competitors drive time to 8 hours or less in order to get to their region’s championship event. The second main issue was a disparity in the number of competitors at Championship events. During the 2014-2015 USAC Bouldering season, the most populated Regional Championship saw 237 competitors whereas the least populated one saw only 66. Additionally, the most and least populated Divisional Championship events saw 603 and 327 competitors, respectively, a difference of almost half. Under the new boundaries, which breaks the country into 8 Divisions and 16 Regions, there is more uniformity in terms of the number of climbers at each championship event. According to numbers provided by USA Climbing, the most populated Regional Championship this weekend had 231 participants, while the least populated had 117, a more palatable discrepancy than in years past. The most and least populated Divisional Championships will have 368 and 258 participants, respectively. The travel time for competitors is also more fairly distributed across the country. Yet despite these improvements, problems still remain. 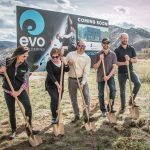 At the end of our interview, Cook said, “There will always be some geographic areas that have further to go than the city clusters … There are several locations where a city alone can have the same number of competitors as several states combined,” Cook said. Dense, urban areas will inevitably have a higher concentration of climbers than rural, less populated parts of the countries. This disparity will likely continue to increase in conjunction with the explosive growth of climbing gyms in urban areas. However, USA Climbing appears well-equipped to deal with these challenges and to adapt to this growth. According to Cook, “USA Climbing By-Laws require that the regional boundaries are revisited every 4 years to keep boundaries up-to-date with the pace and growth of climbing competitors, gyms and teams.” As the demographics of competitive climbing evolve, the regions and divisions that represent them will need to evolve as well. While the regional realignment has changed a lot on paper, the heart of these championship events has stayed the same. Stan Borodyansky, one of the owners at the Summit gyms near Dallas, Texas, said in a phone interview that in previous ABS or SCS Regional Championships that Summit hosted there were “probably just over 100 to 120 people.” This year, however, the Regional Championship that Summit Dallas hosted on Saturday had around 200 competitors, according to Borodyansky. 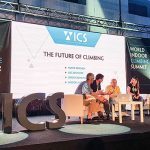 While we can’t ignore the explosive popularity of climbing in general as a contributing factor, the enormous growth in participation numbers at this event is due almost entirely to the realignment. “[The] region is way bigger now … we have a bunch of other teams in the region, which is great because our kids get to compete against others who are really strong,” Borodyansky said. Despite the impact that the realignment has had on the Dallas area, Stan emphasized how important USA Climbing events are to the climbers across the country. “We’ve been [hosting USAC competitions] for so long … we know how important those competitions are to climbing,” he said. While the regional and divisional realignment has done a lot to affect who competes where, it seems that the spirit of these championship events remains the same. These competitions serve not just as opportunities for kids to compete and exhibit sportsmanship, but as opportunities for gyms to showcase their facilities, bring people together, and help foster the local climbing community.